Details of the 2019 Winter Festival will remain on this site for information. The site will not be update again until the next event is being planned. The dates for the 10th Elysian Winter Beer Festival have now been set for 24th, 25th and 26th January 2019 – we look forward to seeing you there. Saturday 26th January – 9.30am – 7pm. No entry after 6pm. Last orders at 6.30 (subject to amount of beer remaining). Please note the following change or this year – the Committee have decided that this year due to capacity issues we will only be open to ages eighteen and over and we will not be allowing children into this year’s festival. Non CAMRA Members: £2 entry, £3 for glass (refundable if not required) and £10 for tokens (refundable if not used) – CAMRA membership can be purchased on the day itself. The venue has disabled access and hot food will be available at all sessions. There will be a wide selection of real ales and ciders on offer for your enjoyment. 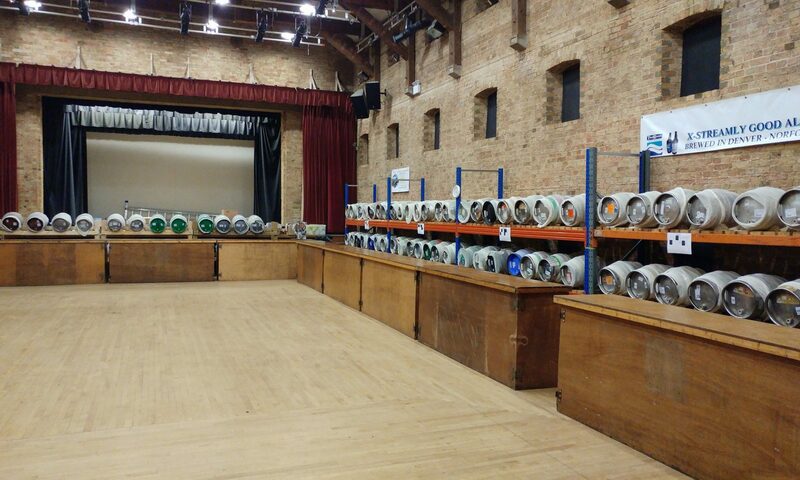 There will be a choice of over 86 real ales including ten key keg, ciders and meads. Also, this year, in response to customer demand, wine will also be served for those attending who do not like ale or cider. The range of real ales will be vast, including from some from brand new micro-breweries as well as beers from the north of England, the Midlands and of course East Anglia. To add to the variety there will be a selection of local ciders. The range of ales and ciders on offer has been chosen to reflect the diverse array of tastes and styles of ales, including a range of Milds, meads, cask lagers and ciders and also gluten free and vegan ales so we hope that there will be at least one beer to suit each customer’s palate. this diverse choice reinforces the claim that we are the biggest and best festival in the Ely area offering the most diverse range of beers and ciders. Others still to be confirmed……. Please be sure to like our Facebook page @ElyAnd DistrictCamra and also follow us on twitter @ElyBeerFestival to receive regular updates. If anyone is considering staying over either on the Thursday or Friday night and fancy somewhere different to stay, The Waternimf a Dutch barge, providing luxury accommodation, moored on the river near to the Maltings, have agreed a special offer of £99 a night, per room, including breakfast. Please quote BEER FESTIVAL. Please note that many details for the festival are subject to change and this website will be updated as and when details are known or change – please regard all information as provisional. The views expressed on this website are not necessarily those of the Campaign for Real Ale Ltd. Whilst every effort is made to ensure that the information on the web site is accurate and up to date, no responsibility for errors and omissions can be accepted. No experience is necessary as training will be provided and a staff meeting will be held on the evening of the 24th January. You do not need to be a CAMRA member to be a volunteer at the event. A free festival T Shirt (subject to availability – they will be given out on a first come first served basis). If you would like to help out, please complete the form available here 10th_elysian_festival_staffing_form and return it as directed. Q. What will the price of the beer and cider be? A. Depending on the strength,the majority of the beer will sell for £3.60, £3.90 or £4.20 – cider will be priced at £3.90. Tokens will need to be purchased which will then be exchanged for beer. Refunds will be issued for unused tokens. Beer and cider can be purchased in thirds, halves or pints. Q. How do I become a member of CAMRA? A. You can join by going to the following link https://join.camra.org.uk/ Also gift memberships can be purchased which would make a great Xmas present for that hard to buy for person –see http://www.camra.org.uk/gift-memberships You can also join CAMRA at the festival and when you do so will be entitled to some free tokens which can be exchanged for beer. Q. What are the benefits of being a member of CAMRA? Q. Will you take cards to purchase beer/cider or for entry? A. No, this event is cash only (but no £50 notes please). There are cash machines nearby which stewards will be able to direct you to. You will need to use tokens to purchase beer which can be bought for cash – cards up to the value of £10 worth of tokens will be available. Q. Will other drinks be available for purchase? A. Yes wine will be available – soft drinks will be available for designated drivers. Q. How accessible is the venue? A. Ely’s excellent transport links make The Maltings an easily accessible venue by train and road, with the station being within five minutes’ walk, and road links to the A1, A14 and M11. Free parking is available across the road at Ship Lane Car Park. The building has good access for those persons with disabilities and stewards will be available to assist as required. We are not however able to guarantee a table for anyone. Q. Can I bring my children with me to the festival? Q. Will you be operating a proof of age scheme? A. Yes – volunteers reserve the right to request ID. As at any licensed premises, it is illegal to buy alcohol if you are under 18, or to buy alcohol for anyone under 18. We will be operating the http://www.challenge25.org/ If you are lucky enough to appear under 25, you may be asked for ID to check you are over 18. The only acceptable ID is a government issued photo ID (photo driving licence or passport) or a proof of age card http://www.challenge25.org/proof.html Please do not be offended if you are asked for ID and we thank you in advance for your cooperation in this matter. Q. Will any money be going to charity? Q. What if I need first aid or other help during the festival? A. Please contact the stewards who will be wearing high visibility tabards or please speak to any member of staff. Q. Will I have to queue? A. There is a limit on the number able to access the building at any one time due to fire regulations – at peak times this might mean that queuing will be in place and entry will be restricted – please bear this in mind when deciding what time you will visit us. Q. Are dogs allowed in the Festival? A. Due to the very busy nature of the festival dogs are not allowed in – the only exception being for Guide Dogs. Q. Can I Smoke/Vape inside the premises? A. The premises will be non-smoking and non-vaping. Areas will be available outside if required. Ely also offers a wealth of attractions for visitors to explore and as the second smallest City in the country can be explored easily in a day by foot. The first port of call for many visitors to Ely is the Cathedral. This imposing structure towers across the fens for miles around. Dominating the skyline, it is one of England’s most beautiful and largest Cathedrals. Known locally as the ‘Ship of the Fens’ it is famous for its unique Octagon tower, which when lit can be seen for tens of miles. The Cathedral is also home to the only national museum dedicated to Stained Glass. If it’s history you’re interested in then Ely Museum, housed in the city’s old gaol, is an excellent place to start. Ely’s most famous historical resident of Ely was of course Oliver Cromwell. The Cromwell family lived in Ely for some 10 years and today you can visit their former house which has been recreated to demonstrate what 17th Century domestic life would have been like along with an exhibition on the civil war. It also doubles as the Tourist Information Centre. Ely has a beautiful waterside area, which is an attraction within itself, where you can explore the many cafes and restaurants or visit the art galleries. Alternatively, simply take time out to relax and watch the river boats pass by. Please note – links to external sites do not imply any official CAMRA endorsement of the opinions or ideas expressed therein, or guarantee the validity of the information provided. Links to commercial sites are in no way an endorsement of the Vendor’s products or services.